Genuine cloth bag for Sanitaire Professional Series Vacuum Cleaners and other upright Sanitaires using Style ST paper bags inside. Includes Plastic bag top and Spring. Fits All Professional Series Sanitaire Uprights with the 2 hole coupler connector. This bag will NOT fit machines with the latch coupler connector. 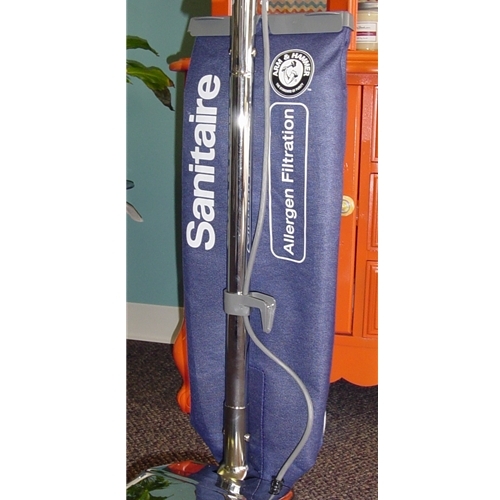 Fits Models: S670 and S677 Replace that old stinky, dust spewing cloth bag with a new genuine Sanitaire cloth bag. If your old bag used F&G style bags you can ugrade to this bag but you will need Sanitaire Style ST Bags for inside. Improve your vacuum's performance with enhanced airflow. Improve your clients satisfaction with better filtration and more efficient cleaning.